“Sanskrit is the divine language… the language of God… Sanskrit and prestige go together in India… The very sound of Sanskrit words gives prestige and power and strength to the race” says Swami Vivekananda. 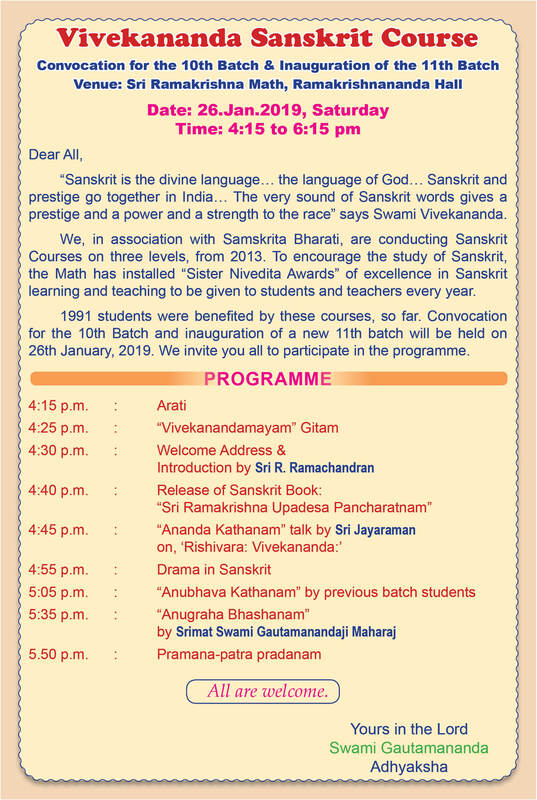 We, in collaboration with Samskrita Bharati, are conducting Sanskrit Courses on three levels, from 2013. To encourage the study of Sanskrit, the Math has installed “Nivedita Award” of excellence in Sanskrit learning and teaching. So far, 1991 students were benefited by these courses. Convocation for the 10th Batch and inauguration of a new 11th batch will be held on 26th January 2019. We invite you all to participate in the programme.